I want to first state that my intention for advocating a natural childbirth is to empower and educate women. I know that not every person will feel the way that I do and that is OK. I also realize that sometimes natural childbirth just can’t happen for a variety of different reasons and there is absolutely no reason any mom should feel bad or ashamed about that. And, sometimes things don’t go as planned, and we have to accept that because giving birth to a healthy baby should be the number one priority for all parents. With that being said, I want to share my birthing stories with you in the hopes that you may learn something about natural childbirth and not be afraid of it. When I was pregnant with my son, who is also my first born, I started seeing a midwife around the half-way point of my pregnancy because I hadn’t decided on a natural childbirth until later on. At that point I decided to learn more about The Bradley Method, which is basically a husband coached childbirth experience. I didn’t take any classes, but instead used a few different books so that my husband and I could learn the different techniques of The Bradley Method. Each night until my son was born, I practiced deep relaxation techniques while listening to soft classical music. My husband learned different ways to help me relax even further, such as how to give me a massage and how to help me manage labor pains. During my pregnancy I ate a healthy diet (minus all the ice cream), did some light yoga each day, and read as much as I could about natural childbirth. I didn’t have too many supporters, but instead had many people tell me how wonderful epidurals are and how crazy I was to want to have a natural childbirth. If you haven’t read my first blog post about Natural Childbirth, you can read more about it here. I was feeling rather achy the night I went into labor. My husband and I did our “birthing exercises” and didn’t end up going to bed until 2 am. Then I woke up at 4 am because I felt a trickle of fluid flowing from my body. So I went to the bathroom to go pee, (sorry if this is TMI) but it wasn’t only pee that was coming out of me. My water had broke, but it was coming out very slowly, almost like a leaky faucet. Nothing like the huge gush of fluid you always see on movies. It felt like I had just gotten to sleep and I wasn’t expecting the baby to come so early because my “due date” wasn’t for another 2 weeks. I had to wake my husband up to tell him the news. We were both so exhausted and very nervous. But I wasn’t quite ready to leave for the birthing center and ended up doing the dishes before we left the house! My husband thought this was rather amusing. I finally called the nurse and told them I was on my way. 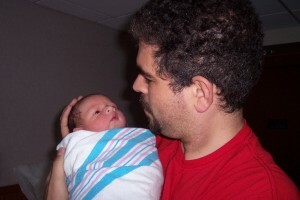 I had my son at an Alternative Birthing Center with a midwife. It was a very long and exhausting day. We were at the birthing center ALL day!!! But my husband was amazing. He was a great coach and if it wasn’t for him, I probably would have given up and asked for the drugs. Because my water broke so early in the morning, and I wasn’t in “real” labor until hours after that, I ended up being at the Alternative Birthing Center for soooooo long waiting for something to happen. I now realize that I should have waited longer before heading to the birthing center, but because this was my first birthing experience, I didn’t know what to expect. My contractions were so weak at first and it took a long time before things really started to progress. So we waited, and waited, and waited……..
Then around mid-day I started to feel the contractions. They progressively got stronger and stronger and more painful as the day went on. All the while my husband was rubbing my back while I lay on my side doing my deep breathing exercises. It hurt a lot and I wanted some relief by going into the soaker tub, but the nurse wouldn’t allow me to use the tub because she thought it would slow my labor down. Well, I am still pretty upset about that part because the reason I wanted to go to the Alternative Birthing Center was so I could use the tubs! However I was allowed to use the shower during that time, but it just wasn’t the same because I wanted my entire body to be submerged into the water. It seemed like the steam from the shower was only making me sleepy. So I decided to get out and lie on my side and do my deep breathing again. I relaxed my body and just let the contractions happen while focusing on my breath and listening to my music. We brought a CD player and the same relaxing music that I used at home when I was practicing the relaxation techniques I had learned from The Bradley Method. My husband was in charge of the music since I was in no state of mind to get up and play around with the CD player. The music really helped me tons. As the night went on, the pain intensified and it was harder for me to ignore it. Finally a different nurse came in and I told her how much pain I was in. She told me I could get in the tub, so she started filling it up for me. Then I was FINALLY able to go in. Awww……it was heavenly!!! But of course as soon as my body hit the water I was so relaxed and the baby was ready to see the world and I was ready to push. I had to get out of the tub because no water births were allowed. Too bad it’s nearly impossible to find a facility that allows them. So I am pretty convinced that the water would have actually helped me to relax even further and sped things up a bit for me. I ended up pushing for a total of 2 hours! For some reason I had a really difficult time getting over the “ring of fire” that I knew was coming. But the good news is that I didn’t tear anything down there!!! The midwife actually ended up bringing in a mirror so I could see what was happening. At first I was very adamant about NOT wanting to see things because I figured that would make it hurt more, but it actually helped me. Once I had the mirror, I was able to just DO IT!!!! One more big push and I had it! I delivered a beautiful and healthy baby boy and nothing could have been better! My midwife was wonderful! She followed my birthing plan exactly as I wanted and gave me the strength and confidence that I needed to get through this experience. I was able to birth with the lights on low while my music kept playing and I kept doing my deep breathing. My midwife was so calm and patient and I was so grateful for her presence. I HIGHLY recommend using a midwife if you are planning on having a natural childbirth. Looking at my beautiful baby was absolutely LOVE at first sight. My perfect baby boy and I were super alert because neither of us had any drugs running through our bodies. It felt very surreal, almost like a dream, and both my husband and I were on cloud 9. I felt so amazing afterwards and all the pain was quickly forgotten and instead I felt this enormous state of euphoria from the natural oxytocin “love drug” that my body produced. Even though I had only slept 2 hours the night before, I was somehow wide awake afterwards and had so much energy. It was definitely a very empowering experience and I am so happy I did it. I know things could have gone very differently had I not had the support of both my husband and my midwife. I trusted my gut instinct that I was able to birth naturally, but I needed that extra little support so that I could push myself to actually do it. And it was ALL worth it!!! Read about my second birthing story here. Read my blog post about Natural Childbirth to learn why I decided to have a non-medicated childbirth.